This is our first homework task for the year. Homework will be due in on Wednesdays. 3/4A have started writing some persuasive pieces of writing. We have learnt that we write persuasive pieces to convince others to change their opinions. Look carefully at the persuasive piece of writing below. Read the piece of writing and complete the tasks below in a comment or you can write it on paper and hand it to Mr Andrew. – Write down what you think makes a good persuasive piece of writing. – What is the author’s opinion? – Write down one of the author’s reasons. – Do you think that this is a good persuasive piece of writing? Explain your answer. a good persuasive writing is when you use the oreo model or the hamuger modle. All children have to play sport. Children all around Australia are getting fatter and fatter and they way we live is making it worse. So how can we help? the best way is to get all ages involved in playing a sport. I do think it is a good persuasive piece because it uses back ups the reasons and using powerful words. I think a good persuasive writing piece is when the writer shows what they really care about and is convincing to make me want to agree. 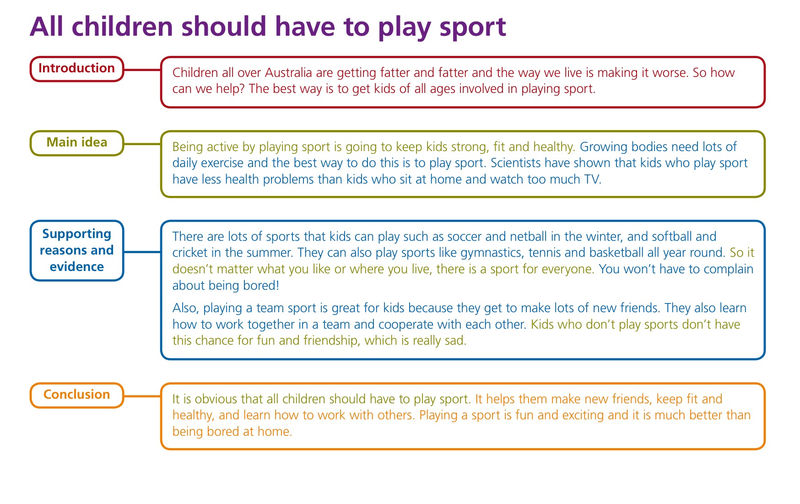 The authors opinion is that all children have to play sport. One of the authors reasons is by playing sport kids will stay strong, fit and healthy. I do think it was a persuasive writing as it convinced me that kids do need to keep strong fit and healthy. Evidence and reasons back to convince the readers. I think the authors opinion is that sports is good for kids to keep kids health and happy. One of the authors reasons is kids are getting fatter and fatter and unhealthy and complaining of being bored there are a lot of sports they can choice from. I think being healthier will keep us fit too. A good piece of persuasive writing is when you have an opinion, 3 reasons and evidence and then your opinion restated. You could use the Oreo model. Every child should play sports. Being active by playing sports is going to keep kid fit and healthy. growing bodies need lots of daily exercise and the best way to do this is to play sport. scientists have shown that kids who play sports have less health problems than kids who sit at home and watch to much TV. I do think this is a good piece of persuasive writing because it has the opinion, the reasons are backed up with evidence. Red represents the red earth, the red ochre used in ceremonies aboriginal peoples’ spirituel relationship with the land. The yellow disc represents the sun, the giver of life and protector. Union Jack represents the first fleet arrived in Australia. Southern Cross represents where we are on the map. The Federation Star has 7 points six of them represents our states sevens star is our two territories. I think that this is not a very good piece of writing because it doesn’t have descriptive language. The authors opinion is that people all ages should get up and play sport. It has a hook in so it probably persuaded people . One of the reasons is that playing sport keeps you fit and healthy. I think it is a good piece of writing because it has all the great detail ‘s. I think this is a good piece of persuasive writing because he/she has evidence. The author’s opinion is kids should play sports more often. A reason is playing sports in a sport team is great for kids because they make more friends. A good persuasive writer has the oreo opinion reason evidence and opinion restated. A good persuasive writer needs to have their opinion, 3 reasons, evidence and opinion restated. The author’s opinion is that all kids should play some kind of sport, for example: My sister and I played soccer last year and now my sister plays soccer still. One reason is that so it doesn’t matter what you like or where you live, there is a sport for everyone. This is a very convincing persuasive piece of writing because she\he has got the opinion, 3 reasons, evidence and opinion restated. A good persuasive writer has good information about what they are saying. He is trying to say that kids need to play sports when young to grow up healthy. One reason is to make new friends and keep fit and healthy. Yes because it explains all the good reasons for kids to be healthy and have fun. -Write down what you think makes a good persuasive piece of writing. -What is the author’s opinion? He thinks that all children should play sports. -Write down one of the author’s reasons. It keeps kids fit and healthy and gives them the chance to meet new friends. -Do you think that this is a good persuasive piece of writing? Explain your answer. Yes, because it backed up the authors opinion with evidence and reasons.